and watch your rewards grow! When Can I redeem my "Beauty Bucks"? : You can redeem your BB as often as you like for discounts on Service & Retail Products at Sean Patrick's. When you check out at the front desk, the bottom of your sales receipt will have your total points balance. When you are ready to redeem, simply let one of our front desk coordinators know that you would like to redeem your points and they can redeem them from your total bill for that specific visit to Sean Patrick's. Bonus "Beauty Bucks": There will be various products throughout the facility that display "Double Points Product." When you purchase one of these specified products, double points will automatically be posted to your account. We will also have several opportunities to earn bonus BB on services and via other actions such as pre-booking your appointments. Look for signs throughout the salon and check your email and our Facebook page for specific promotions. Do "Beauty Bucks" expire? : Yes. Beauty Bucks will expire every January 30th, beginning 1/30/2018. Points cannot be redeemed when you are using a special offer/promotion. You will still earn points, but you cannot redeem them during that visit. Sean Patrick's Salon & Spa reserves the right to change this Rewards Program at any time. 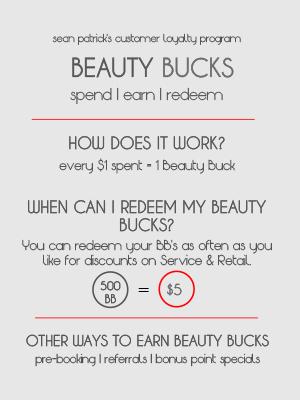 Products or services purchased with Rewards Program points (Beauty Bucks) are non-refundable and Beauty Bucks are non-transferrable or redeemable for cash.